Learn how to sing in a choral environment& improve your skills as a singer! 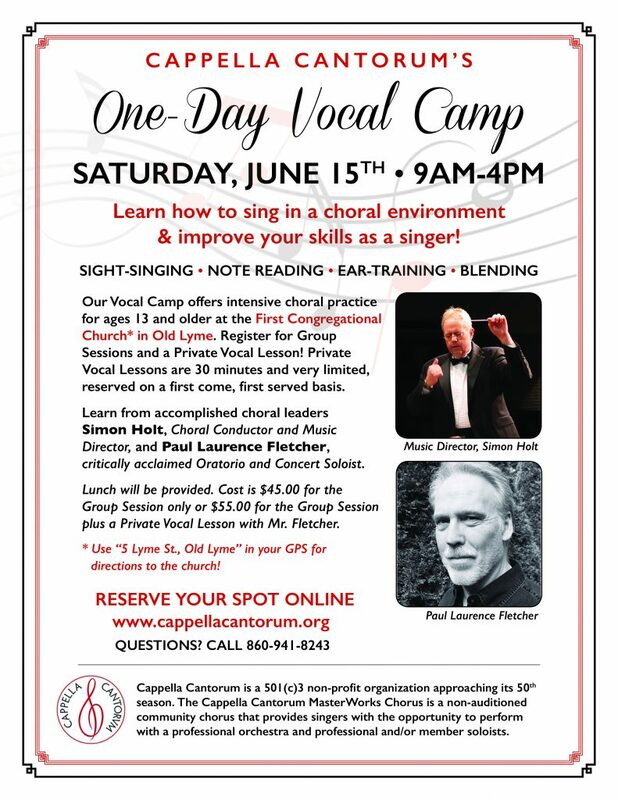 Our Vocal Camp offers intensive choral practice for ages 13 and older at the First Congregational Church* in Old Lyme. Register for Group Sessions and a Private Vocal Lesson! Private Vocal Lessons are 30 minutes and very limited, reserved on a first come, first served basis. Learn from accomplished choral leaders Simon Holt, Choral Conductor and Music Director, and Paul Laurence Fletcher, critically acclaimed Oratorio and Concert Soloist. Lunch will be provided. Cost is $45.00 for the Group Session only or $55.00 for the Group Session plus a Private Vocal Lesson with Mr. Fletcher. Please note, there is a small additional fee for online orders. * Use “5 Lyme St., Old Lyme” in your GPS for directions to the church! Cappella Cantorum is a 501(c)3 non-profit organization approaching its 50th season. The Cappella Cantorum MasterWorks Chorus is a non-auditioned community chorus that provides singers with the opportunity to perform with a professional orchestra and professional and/or member soloists.